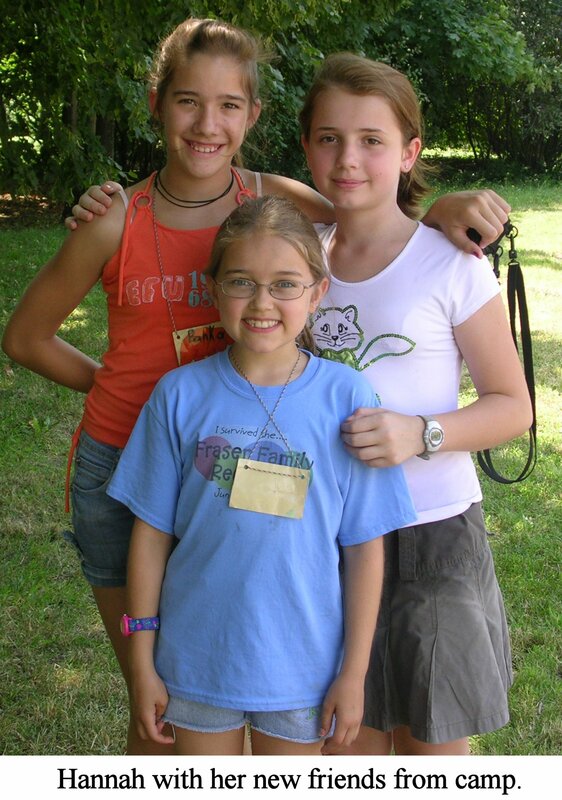 We took a two-week break from setting up our new apartment to attend the English Camp in Vác. There were two camps running simultaneously, one for younger children and one for teens. Tricia was involved with the younger camp where Hannah and Matthew were participating as campers, while I was in a conversation group in the teen camp. We had a group of Americans that came over to work as staff in the camp, along with a zany fellow from Scotland who has come for several camps in the past and loves coming back every year. Our kids loved the camp and loved making new friends. Hannah made fast friends with two girls from the younger camp. Later, it turned out that one of the girls lives in Budapest, actually lives in the same district as we do, and in fact lives about a five-minute walk from our apartment! Considering that we live in a city of two million people, this seems nothing short of remarkable to us and is a huge answer to prayer. Hannah was especially hit hard by leaving all of her friends in Fillmore, NY, so we very much wanted her to find a friend for her quickly. That we were able to find one who lives so close and knows at least some English is a great blessing. We have already been invited by the family to go over for a visit today. The girl’s parents are very friendly. They don’t speak much English themselves, but they seem eager to be friends with us. We praise God for this answer! Attendance at camp seemed a bit low this year, though we’re not sure why. Nevertheless, there was a very good atmosphere (in spite of the sometimes unbearable heat! ), and relationships were made or deepened. We have heard initial reports of a couple of campers who came to the Lord for the first time, and we know that others were challenged in their thinking about God, while others were deepened in their knowledge of Him. The conversation group that I was involved in had three staff people but only two campers! But the two campers were college-aged, had quite good English, and participated very thoughtfully in the conversations. Both of them had been to previous camps and wanted to come back. We discussed many important questions related to God, the meaning of life, and moral truths. Our group translator, Saci (pronounced “shot-see”) has been with OMS in the English camps and at our church in Budapest for many years. She has a strong testimony and loves to share about the Lord with the students. So we are very glad that we participated in camp. I hope to have a video blog about our camp experience soon. We are also in the middle of trying to finish getting our apartment together so that we can get back to living a normal life (as opposed to life with boxes, suitcases, and other items strewn about our home!). Our first week in our new apartment has been busy. We’re down to the last four or five tubs that haven’t yet been completely unpacked. We came here with nine tubs and a suitcase (besides all of our carry-on baggage which we maxed out), and I brought 6 tubs with me when I came over in May. We’ve been able to get a good amount of furniture quite quickly between items left here by former missionaries (thanks, Chip and Jenny!) and borrowing from our landlord, who has been very helpful. Not bad, considering that our apartment was almost entirely unfurnished when we arrived. Getting settled in has been a lot easier this time than it was 8 years ago when we did it for the first time. It helps when you know where all the stores are and which ones to go to. It also helps that I can speak Hungarian well enough to do any kind of purchasing transaction. Hannah and Matthew have actually remembered quite a lot from when we lived here before. Last week we went to a little ice cream parlor on the corner down by our old apartment (which is about four or five blocks from our new place). They both remembered the place, and in fact Hannah even remembered one time when I took her to the parking lot right across from the ice cream place to learn to ride her bike without training wheels. I was surprised that she remembered that. As we were eating ice cream, I asked the kids if they felt like they were in a foreign country yet. Of course they asked what foreign meant, so I explained it was a country other than your own. They both said no. They seem to feel right at home, which is great at least for now. We’ll see how it goes as things progress. Hannah misses all of her friends from back home, although she’s actually been able to communicate with some of them through email and VoIP phone. For me this move has been quite a smooth one. We already have our internet hooked up in our apartment. I ordered it on Friday and it was installed on Monday even though they told me the average wait time was 9 days. What a contrast to the first time we came in 2002. Back then we had to wait three months to get a phone line just so we could have dial-up internet access to do email. For the first three months I took the tram to the nearest mall to use their internet cafe. Now within a week we have wireless broadband internet in our home. Amazing! Wireless internet use has really exploded here. I can see three or four other wireless networks in range here, and I’ve seen several others at different times. I have been asked how our support has been doing since we had our last couple of meetings before we left. The answer to that is that it hasn’t really changed. We are still at about 93% funded. However, we are very excited at how the Lord provided for us leaving from the States. We received a large donation several months ago from Canada, but because of the processing time for Canadian gifts it only came through last month as we were leaving. The amount was just enough to cover our airfare and extra baggage costs. So we praise the Lord for that! For those who might be interested in helping with our support, you can donate online by following the link on the sidebar. 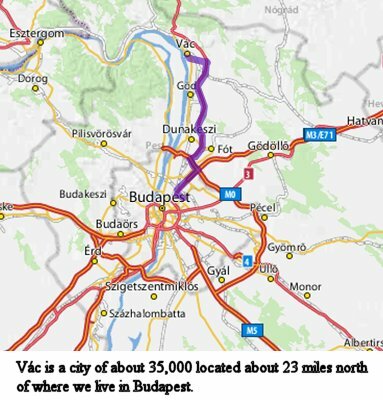 Next week we go to English camp in Vác (pronouned “vats”). Hannah is extra excited because she’s actually old enough to be a camper herself, not that she really needs to learn English. But she has been particularly affected by not having friends her age yet, so I think camp will be really good for her. Tricia will probably be spending a lot of her time following Jonathan around and keeping him out of trouble. She’ll have the company of another missionary mom here who’s in the same boat. I will have to come back for a meeting of the Wesleyan Alliance theological school, so there will not be much time to rest.